The Surface Water and Ocean Topography (SWOT) mission will provide sea surface height (SSH) observations that will resolve features with wavelengths of 15-100 km, which will allow the full range of mesoscale ocean variability to be measured. A critical step in interpreting the SWOT signal will be to distinguish the mesoscale signals (wavelength > 50 km) from the other signals that will be detected by SWOT (e.g., submesoscale features, internal waves and tides, swell). This is a non- trivial problem, as these processes are not well understood or modeled. A further complication is that SWOT will have a temporal resolution of ~10-20 days, making it difficult to identify the quickly- evolving submesoscale field and internal waves. Tackling this problem requires a better under- standing of ocean dynamics across the range of scales and regimes that SWOT will measure. Quantify and characterize ocean variability at 15-100 km wavelengths in regions with different dynamical regimes. Evaluate how mesoscale, sub-mesoscale, and fine-scale processes will be reflected in SWOT sampling. Develop a sampling strategy for future SWOT validation efforts and for designing integrated regional observational arrays. Figure 1. (a) Percentage of time a given pixel is located within a coherent mesoscale structure (includes eddies and meanders) based on the altimetry-derived mesoscale eddy database of Chelton et al. (2011) (courtesy of Peter Gaube, APL-UW), demonstrating the strong mesoscale eddy variability in regions such as western boundary currents and the Southern Ocean. Note that only eddies with wavelengths greater than ~100 km are effectively captured. The locations of each of the Seaglider datasets are outlined in black. (b) Individual Seaglider track locations for each of the Seaglider datasets (the SPURS-2 deployments are ongoing, so no tracks are shown). Gliders are a unique platform from which to sample the spatial and temporal scales that are relevant to SWOT. Seagliders are autonomous underwater vehicles that glide in a sawtooth pattern from the surface down to a maximum of 1000 m depth while collecting profiles of ocean temperature, salinity, pressure, etc. (Eriksen et al., 2001), from which steric height can be computed. Gliders move horizontally at around 0.25 m/s, taking ~4 hours to cover a 4-km lateral distance for a typical 1000-m dive. A single Seaglider can thus cover around 20 km per day. 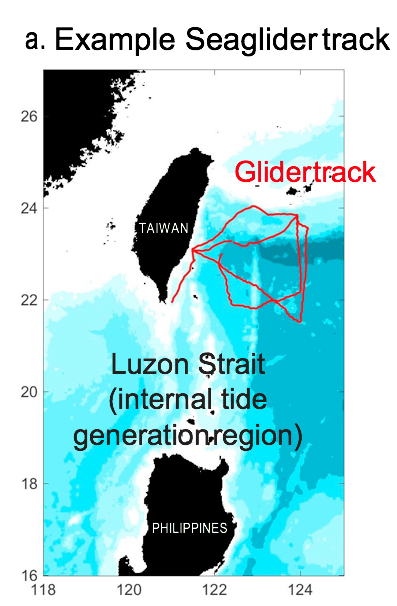 With typical 4-km separation between Seaglider profiles, and 150-300 km transects covered in 8-20 days, the spatio-temporal resolution of the glider data is similar to that of SWOT. Figure 2. (a) Example of one Seaglider track in the OKMC region. (b) Time series of submesoscale steric height (i.e. mesoscale signal removed) and its components: diurnal mode-1 and non-mode-1 (red thick and thin lines); semidiurnal mode-1 and non-mode-1 (blue lines); inertial (green) and the residual grey), which represents the part of the signal we cannot predict. The RMS steric height for each component is shown on the right-hand-side of the plot. (c) As for b, but for model steric height that has been interpolated to the Seaglider track. 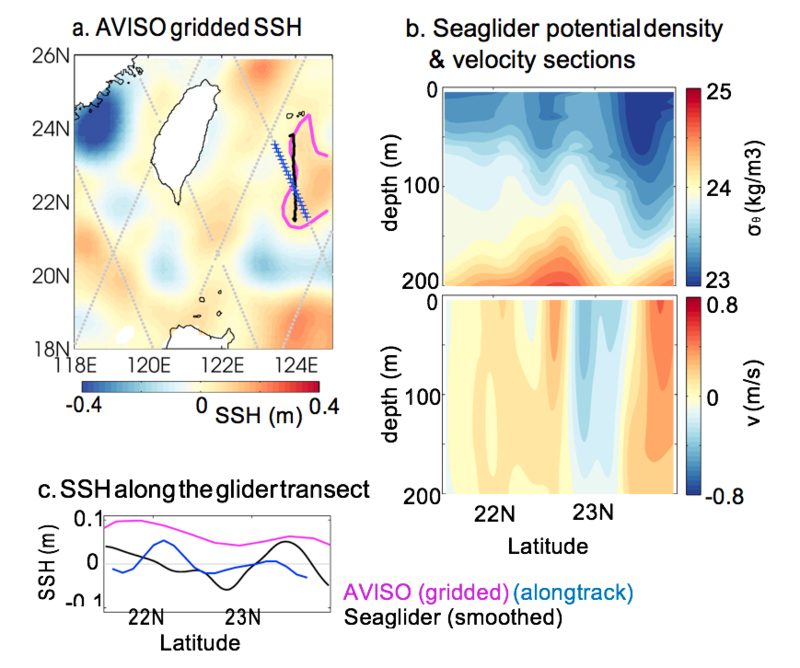 Seaglider data will be used to quantify and characterize 15-100 km SSH variability, specifically due to internal tides and mesoscale eddies. In parallel with the Seaglider analysis, output from the year-long 1/48° MITgcm model will be used to characterize these same features. This will allow us to both validate the model as well as evaluate the impacts and limitations of the Seaglider sampling pattern. 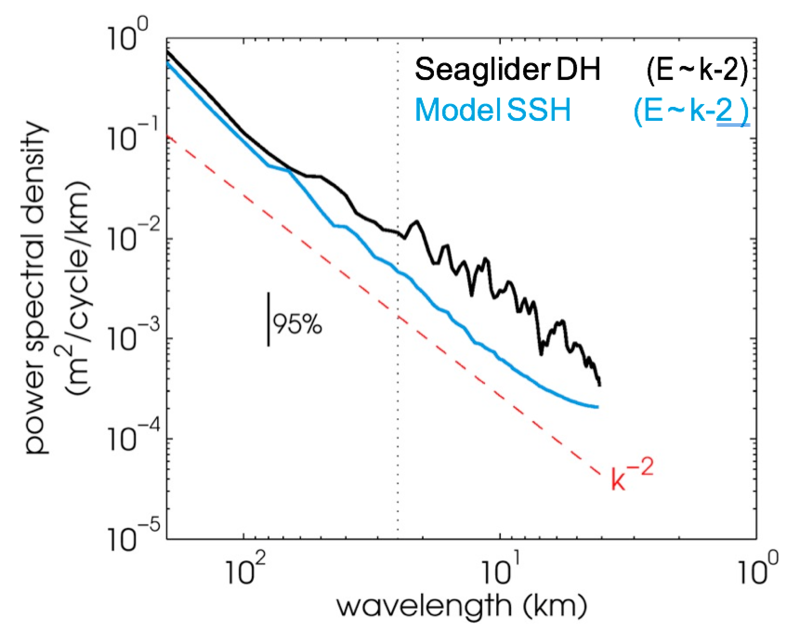 Figure 3: Wavenumber spectra from Seaglider dynamic height (black; from seven 200-km-long transects) and model SSH (blue); both Seaglider and model data are from the OKMC region. Slopes fit to the spectra are noted in the legend and the k−2 slope is shown as a dashed red line for reference. The 25-km wavelength is indicated with a vertical dotted line: at shorter wavelengths, the Seaglider spectra are expected to be contaminated by aliasing from internal tides. The 95% confidence level for the Seaglider data is indicated with a vertical bar. We make use of existing Seaglider datasets in five regions (Figure 1), all of which have different submesoscale, mesoscale and mean properties. We build on the work by Rainville et al. (2013), who used Seaglider data to estimate the local internal tide phase and amplitude. In each region, we will use Seaglider observations to characterize the steric height signal of internal tides, including their spatial and seasonal variability, depth dependence, and the proportion of the mesoscale SSH signal they comprise. Figure 2 shows an example of the steric height signal from Seaglider mea- surements in the OKMC region, which has been broken into diurnal and semidiurnal internal tidal constituents, inertial variability, and a residual. The model and observations agree remarkably well, indicating that the model can capture steric height variability due to internal tides. Comparisons of the model steric height calculated by integrating potential density from 1000 m versus to the bottom (not shown) reveal that the Seagliders, which only sample to 1000 m, can capture ~80% of the high-frequency variability. 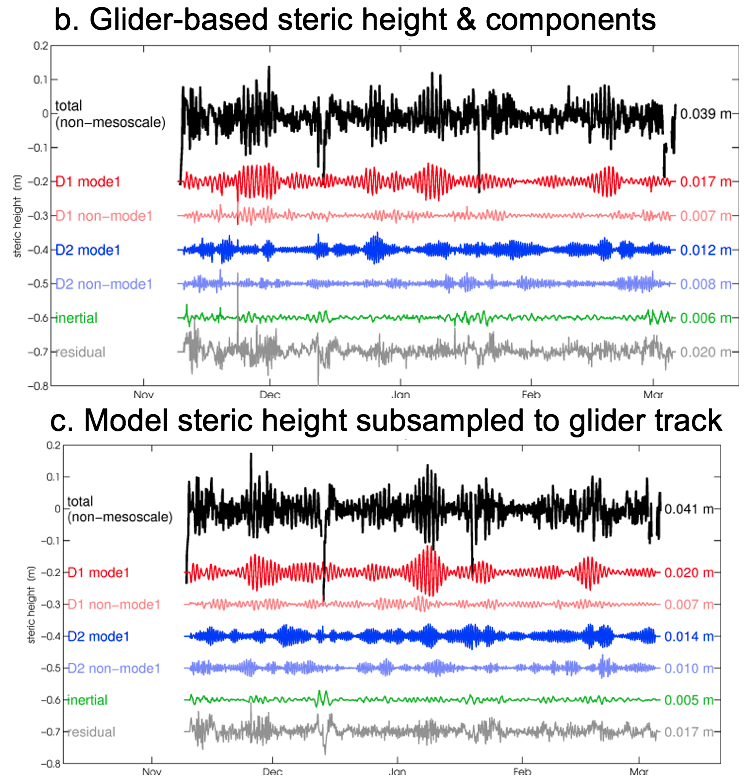 Wavenumber spectra of glider-derived steric height will be used to quantify submesoscale to mesoscale energy. Spectral slopes, as well as their regional and seasonal variability and dependence on the background stratification and velocity field, will be computed from Seaglider data and model output in each region. Figure 3 shows an example of wavenumber spectra from the Seaglider data and from the model output in the same region: as the slopes are similar, if slightly steeper (weaker submesoscale energy) for the model. At wavelengths shorter than 25 km, the Seaglider data are aliased due to the motion of the glider. Following the analysis of Pelland et al. (2013), Seaglider measurements, in combination with satel- lite altimeter observations, will also be used to quantify the mesoscale eddy field in each region. Specifically, we will identify and characterize individual eddies and develop statistics about their SSH signature and spatio-temporal variability. An example of this is shown in Figure 4. Figure 4: (a) SSH and (b) SST extracted from the model simulation (OKMC region). A mesoscale eddy is visible in the SST field (south part of the boxed region in b but it cannot be distinguished in the SSH field, which is dominated by large-scale variability and internal tide signals (visible as curved bands, e.g. in the northeast part of the domain). (c) SSH with internal tides removed: after fitting and removing tidal harmonics to the time series at each pixel, the eddy can be seen as a depression in SSH (i.e., blue shading). (d) Simulated SSH along the SWOT swath, including measurement error and noise, estimated by using the data in a as an input to the SWOT Simulator. Here, we address the question of what part of the 15-100 km SSH signal SWOT will actually see. We will use statistics gleaned from Objective 1 along with simulated SSH from the SWOT Simulator. We also consider the impacts of the Seaglider sampling on interpreting those data (e.g., Figures 2 and 3). For each of region, we will use the SSH fields extracted from the numerical model as inputs to the SWOT Simulator and will assess the impacts of SWOT sampling on interpreta- tions of wavenumber spectra and the ability to detect mesoscale eddies and internal from SWOT data. It is anticipated that SWOT will provide an unprecedented view of the ocean, particularly on a regional scale. Longer-term goals of our project are to develop a sampling strategy for future SWOT validation efforts and to develop techniques for integrated regional observational networks involving in situ and SWOT observations as well as other remote sensing measurements. High-resolution numerical models will play an important role in this approach: our goal is to both make use of and build on numerical models as we learn more about submesoscale-to-mesoscale ocean dynamics, improving the observations and the models in an iterative process. We will assess what processes are not resolved as a result of spatial or temporal gaps in the existing observational and modeling networks (e.g. distinguishing the coherent and incoherent internal tide signals), and what instruments, models, and sampling can be used to obtain that information. Chelton, D.B., M.G. Schlax, and R.M. Samelson (2011), Global observations of nonlinear mesoscale eddies, Prog. Oceanogr., 91(2), 167–216, doi:10.1016/j.pocean.2011.01.002. Eriksen, C., T. Osse, R. Light, T. Wen, T. Lehman, P. Sabin, J. Ballard, and A. Chiodi (2001), Seaglider: a long-range autonomous underwater vehicle for oceanographic research, IEEE J. Oceanic Eng., 26(4), 424–436, doi:10.1109/48.972073. Pelland, N.A., C.C. Eriksen, and C.M. Lee (2013), Subthermocline Eddies over the Wash- ington Continental Slope as Observed by Seagliders, 2003-09, J. Phys. Oceanogr., 43(10), 2025–2053, doi:10.1175/JPO-D-12-086.1.